At Community Living Australia we are proudly a values based organisation committed to delivering the highest quality supports and services to our clients. As such, we are very excited to be launching our new workplace values which will play an important part in shaping how our services are delivered, as well as how we as an organisation and as individuals within it behave. 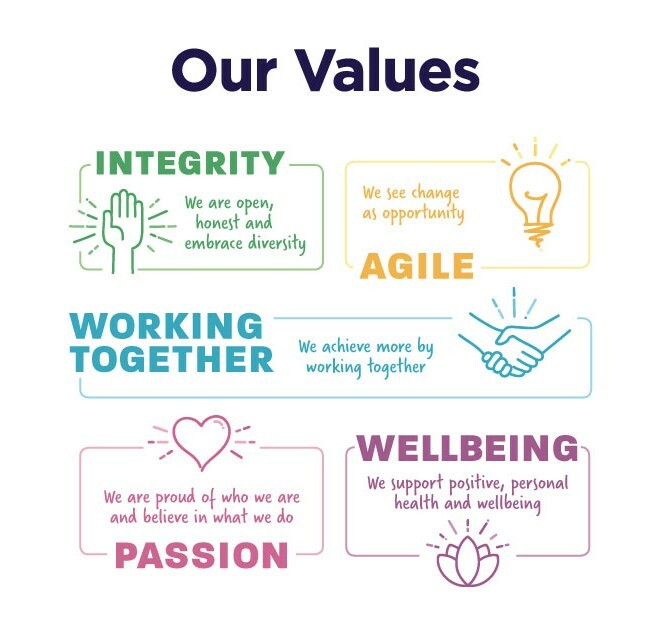 The purpose of creating these values is to make Community Living Australia a great place to work and to ensure we have a culture that supports people to be their best and in turn deliver the best services possible to clients. These values were determined through extensive consultation with a wide range of employees from across the organisation and represent what was discussed as being valued, required and desired by these employees. We are open honest and embrace diversity. We achieve more by working together. We support positive personal health and wellbeing. Community Living Australia Chief Executive Mark Kulinski said these new values are an important part of the organisation’s foundation. We look forward to the future with confidence as we continue to keep our focus on delivering exceptional services for our clients while also maintaining the continued wellbeing of our staff.